The puzzle piece has come to be known worldwide as a symbol for autism. This colorful design is one that has meaning to many who are impacted by autism. It says so much, and yet…..it leaves out so much. I look at autism as simply one thread in the rich tapestry of our son’s life. Tapestries are beautiful works of art. They can tell a story or give you a glimpse into the life of the one who made it. Each thread interweaves with the threads around it. A single thread touches many. Think of how a weaving is done. You have the main foundational threads on the loom through which the colorful threads are woven to create the design. Autism is simply one of those foundational threads. Why do I say it is foundational? Each and every thing that Pookie learns or experiences is touched by autism in some form or fashion. Whether it be through the developmental delays he is challenged with, interacting with others, or simply going grocery shopping with me, autism is always there. You cannot separate fully the autism from Pookie’s life experiences. But, Pookie is far more than just that one thread. He is a much loved son, brother, and friend to those in his life. He may not play with kids in a way considered “normal” by society’s standards, but he likes to be around other kids. At church, the older children have taken Pookie under their wings so to speak and they include him in their activities as much as he able to participate. At home, Pookie loves to simply hang out with Little Miss. If he finishes his homeschooling before she does, he gets antsy for her to finish so that they can go outdoors together. Pookie loves to paint. Some days, he simply makes what could be considered background designs. At other times, he has made paintings that are reminiscent of the Impressionist style. I will always cherish the first of these that he made at age 4. He was standing at a window looking out and seemed so sad. I tried to distract him without success until I asked if he wanted to paint. He came to the kitchen table and chose the paint colors that he wanted. 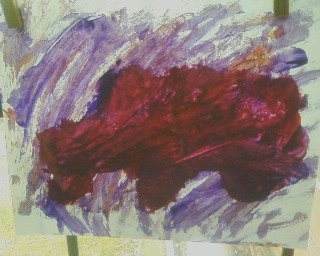 The end result was the painting below. He was telling me something in that picture. His Daddy was gone on the truck and he was missing him. When I asked if he missed his Daddy, Pookie smiled at me. His mood lifted after that. We had found the source of his sadness and acknowledged it. Pookie loves music. He loves to listen to K-Love, a Christian radio station. When we are in the car and the radio is not on, he will fuss and gesture towards the radio. If I turn on a station other than K-Love, he will fuss again until I change the station. Luckily, we all enjoy listening to it. He listens to the three VeggieTales CDs that the kids own. Often, after listening to them, he will hum the tunes or sing them in his own way. Pookie has a sense of humor. He laughs easily. One quirk that is present with him is his ability to make himself laugh by tickling his own belly. He has a joy that is infectious to those around him. His happiness can make anyone smile or laugh. Cuddling is important to Pookie. He loves those times when I sit down to read to him. I will tell him to choose a book from his shelf. After making his choice, he comes to the couch and cuddles next to me while I read. There are so many ways in which our lives are blessed by Pookie. Often, we don’t even consider autism in his behavior or developmental skills level. He is simply our son. We accept him as he is. Of course, we are working towards him becoming as independent as possible. His therapies are helping us to achieve that goal. When it all comes down to who Pookie is, there is much more than just a diagnosis of Infantile Autism. He has a life that is full of the love of family and friends. He has talents that we have only begun to see being developed. He is a little boy who has so much to offer those around him. He is a walking testimony of the grace and blessings of a God who is more powerful than autism. He is our son. Since finding out that Pookie was autistic, we have been working at helping him to gain as much independence as possible. There is such a stigma attached to Infantile Autism. Unlike those with the higher functioning autism spectrum diagnosis, kids like Pookie are often underestimated in what they are capable of. Many times, a parent of a severely autistic child will be given little hope. Last September, a Pre-K school teacher told me to not worry about teaching him academics in our homeschooling. She felt that he would be better served by focusing on life skills only. Her reason? She said that by focusing on the life skills, we will help him to be less of a burden on his caretakers in the future. Her words were cutting, but I have had to take a step back as really examine her thinking. Unfortunately, unless your child is moderate to high functioning, this attitude is not uncommon. It doesn’t mean that those who say it are correct, but possibly uninformed. A reality that we face with Pookie is that his ability to do a skill can change literally from one day to the next. For example, he was learning to feed himself then lost the ability after an illness. It is like someone erased the knowledge of how to perform that skill from his mind. After a time, he slowly regains the skill. It takes a lot of work though, as well as a lot of patience. You have to look past the idea that he could feed himself before the illness and start over from square one. Sometimes, the amount of time that it takes to regain the skill is far less than it took to learn the skill the first time. That is a blessing in and of itself. Most recently, Pookie has been working on the self-feeding issue……again. He was only using a spoon or fork for about 2 months before he was ill with a fever in September. Ever since then, we have had to work with him to re-teach the skill to him. Suddenly, after a couple of months of working with him, I was able to get this picture. Pookie loves peanut butter. I usually buy several of the small jars from a $1 store each payday. I had noticed that the larger jar of peanut butter was getting low a lot faster than normal. Then, I found out why. Pookie had learned to remove the lid, grab a spoon from the drying rack and feed himself the peanut butter. Watching him, I realized that he would do this with peanut butter because it stuck to the spoon. Pookie gets easily frustrated if the food he is eating falls off of the utensils. 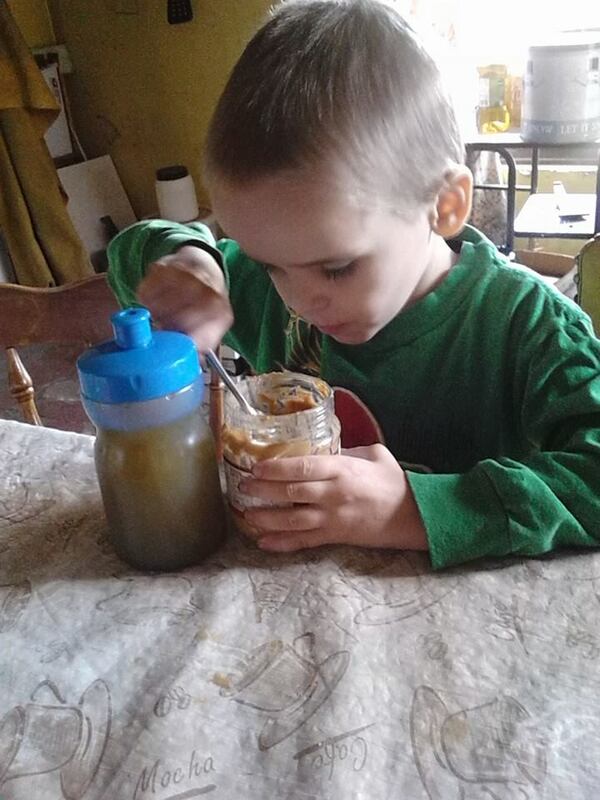 The stickiness of the peanut butter made it the perfect food for him to eat on his own. I also noticed that he is able to hold these little peanut butter jars much easier. Unlike a plate, bowl, or even the larger peanut butter jars, these little ones offer him more independence. With that in mind, I saved several of the jars to use as dishes for him. I have a baby food grinder that I bought back when Little Miss was a baby. It allows me to take any meal and turn it into a finely chopped food that is similar to a junior baby food consistency. At that texture, the food stays on his spoon far easier just as the peanut butter does. I place his meal into the jar and he is able to feed himself. This may seem like such a little thing. Pookie is 5-1/2 years old. What people don’t always realize is that developmentally, he is far younger than his chronological age. For him, this step towards becoming more independent is huge. With this single skill, he is able to take more control over his eating habits. Being able to self-feed eliminates nearly all the frustration that he had been feeling during meal times. He doesn’t have to wait for someone to feed him each bite. He is able to do it for himself. Another self-feeding development is that he is once again feeding himself finger foods. If we go to Wendy’s for lunch, I just have to cut his food into bite size portions. He can now feed himself, as long as someone touches his arm or shoulder. We jokingly refer to it as his start button. Just another autism quirk he displays. As long as you touch his arm or shoulder, he will feed himself. If you don’t touch him, he will wait until you do or will start getting fussy as he waits. We went through this stage before. It doesn’t last terribly long and always proceeds him becoming fully independent in whatever skill he is working on. It is a journey. I am constantly amazed at how many basic skills come seemingly by instinct in typical kids. Seeing how hard Pookie has to work to obtain these seemingly natural skills makes me more aware at just how intricate a child’s development can be. Milestones that others take for granted are hard work for Pookie to achieve. Each skill mastered, however big or small, are simply a step towards him becoming as independent as possible. We have high expectations for Pookie. We are realistic, yet we refuse to set the goals too low for him. If we expect little from him, he will gain little. If we expect him to reach the stars, then he will continue to work towards that goal. He may not actually reach the goals, but he will be much further down the road than if we expected little from him. Our goal for Pookie is for him to have a life as an adult where he needs little assistance. Who knows? Maybe one day he will be able to overcome his challenges enough to marry and have a family of his own. There is only one who has the authority to set limits on what Pookie will be able to do in his life. That authority belongs to the one who created Pookie. No, I don’t believe the Lord made Pookie autistic. I do believe that He allowed it for a purpose. I truly believe that one day Pookie will be able to share his testimony of what he has been able to accomplish, in spite of being autistic, with the Lord’s grace and blessing. We are a family of readers. I read to the children each day, both for homeschool and bedtime stories. Little Miss is reading on her own now and Pookie loves to look through books. While on the truck, my husband has been known to take audio books with him. Needless to say, books are enjoyed by us all in one form or another. Each day, the children have an hour of quiet time after lunch. We awaken early each day and that midday rest period really makes a difference. I have been thinking about the idea of allowing the children to listen to audio books during that time. Here are some links to a few of the free audio book downloads that I have found. While I was searching, I also found some sites with free downloads of Bible Stories for children.